July | 2008 | Windowcraft Industries Ltd.
How high, low or wide should a window be? Technology has allowed glass to be made in very large sizes, but do we want to live in a fish bowl. There are many controlling factors such as room size, building code restrictions, but what size should a window be? This is an interesting question. Try this experiment. Stand at a blank wall at arms lengths. Look straight ahead, and without shifting your eyes attempt to determine your vertical and horizontal focal distances. A friend with a tape measure may need to help you here. The arms length distance is your area of protection. It is the distance that you keep when talking to someone, unless of course you know this person more intimately. It is also the distance that you feel secure when looking out a window, especially an upper floor. This focal range varies on the person, but the writer found his range at two feet above the floor to about the eight foot level vertically and about four feet on either side horizontally. Coming any closer to a window changed this perception immediately. Try another experiment. Hold hands with another adult of a fair difference in height. You will notice that your fingertips are at about the same level, probably a bit more than two feet above the floor. Again this is a level of comfort. Anything below that requires you to stoop, putting you out of balance. Window-wise anything below this comfort level requires an adjustment in perception. These are some suggestions. Stand farther away from the opening to increase our focal distance. Not a productive move. Bring the immediate exterior view closer to you with grading, or plants creating a horizon line within our comfort level. 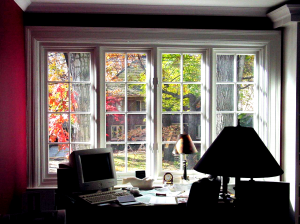 Provide a visual break such as dividing mullions, muntin bars, leaded glass, or a window seat. The window could be narrowed to bring it into focal range. It is these considerations that make a window more than just an opening in a wall.